Today we proudly present to you Twelve24’s colorful and electrifying new video “Higher.” Twelve24 are based in Manchester, England but were all raised in 3 different countries. Ryan from America, Christina from Ghana and Josh from their base town, Manchester, UK; three unique countries, telling three unique stories. 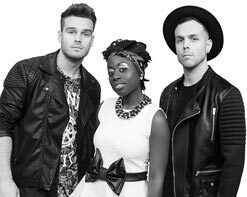 The band formed in 2008 through a charity called The Message Trust training course ‘Message Academy’ where each member developed a burning passion to make a difference in this world through the music they make and the Christian faith that they have. Considering how passionate the group is about their purpose it is no surprise that they are as equally passionate about creating the best possible music and videos to share their positive message. The hot new single “Higher” is a celebration of the positivity they strive to spread every day. An old school loop that would make any boom bap fan bounce sets the foundation for this song, while a soulful delivery over top will make you pine for your collection of De La Soul! But don’t get us wrong, this is not some one trick pony that simply plays on nostalgia. The production is hotly contemporary and could effortlessly glide right into a mainstream pop playlist. For the “Higher” video, Twelve24 knew they needed to create a visual that matched the energy and vibrance that not only matched the life of the song, but also something that appropriately showcases their 3 unique personalities. Ladies and gentlemen, they nailed it! Enlisting some help from their pal Deronda K. Lewis to spice things up even more, they’ve brought us a whirlwind of of vivid imagery that blasts like a primary color palette across the screen. A variety of backgrounds represent different artists and their work, much like Twelve24 represents the coming together of different upbringings into one common good. The stellar backgrounds are top notch, but what really shines is the band performing in front of them. They dance, they sing, they rock, and most importantly they smile! You can see the pure joy in their eyes as they perform and never let us forget that spreading true happiness and real love is always at the core of their mission! We are delighted to be working this fantastic outfit from the UK! They’ve already secured their place in mtvU rotation with a convincing victory in the mtvU Freshmen competition, and we know you and your viewers will absolutely love it like we do! Please contact Andy Gesner and the HIP Video Promo staff at (732)-613-1779 or email us at info@HIPVideoPromo.com for more info on Twelve24.